Plan4Health Tarrant County aimed to build on existing efforts and improve access to local, fresh food in Southeast Fort Worth, Texas, through partnerships, new initiatives, and incorporating a public health perspective into planning efforts. The target areas of Southeast Fort Worth, in Tarrant County, have a combined population of more than 100,000. Residents are predominantly African American and Latino/Hispanic, with these two demographics making up 78 percent and 18 percent of the population, respectively. Residents tend to have lower income levels and lower education levels compared to the county as a whole. Chronic disease rates are higher compared to the rest of the county as well. Recent data revealed higher rates of diabetes (12.6 percent), heart disease (6.4 percent), high blood pressure (29.9 percent), and overweight or obesity (71 percent). Community leaders have recognized chronic disease as a major concern and recent feedback found that the top five priorities to address chronic disease disparities included food access. "With our eyes focused on better health, we as a community are collaborating with our schools, area leaders and retail to enhance the collective health of our neighborhood." Plan4Health Tarrant County increased the availability of healthy foods by promoting retail policies and practices, including piloting food carts and a mobile food market, as well as recruiting stores to participate in a Healthy Corner Stores program. The project worked with the new owners of Ramey Market to transform their store into the first healthy corner store pilot in the county. 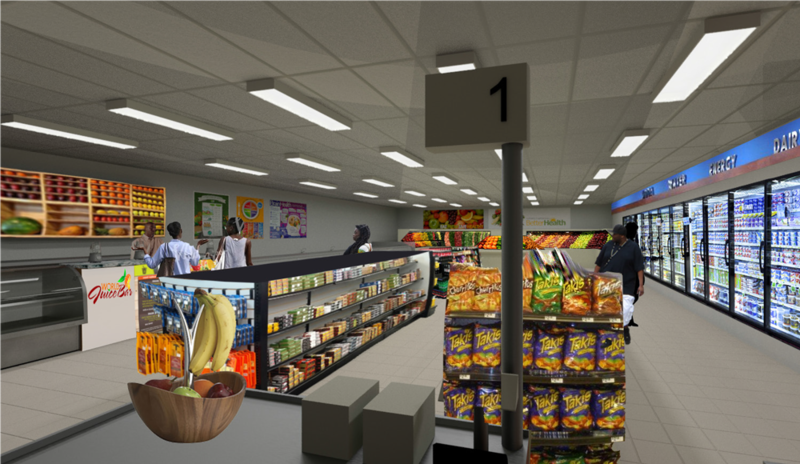 With the help of the Plan4Health team, the interior of the store was re-organized to make it easier for customers to find fresh produce and other healthier foods and beverages. Students from the Institute of Urban Studies (IUS) in the College of Architecture, Planning, and Public Affairs at the University of Texas at Arlington provided design recommendations and proposed store layouts to support store owners and to bring the program concepts to life. Proposed design for interior of Ramey Market. Image from Plan4Health Tarrant County Report prepared by students from Institute of Urban Studies (IUS) in the College of Architecture, Planning, and Public Affairs at the University of Texas at Arlington. On the outside, the store received some fresh paint, including a mural painted on one full wall. The mural was designed and painted by the senior art students at Dunbar High School. 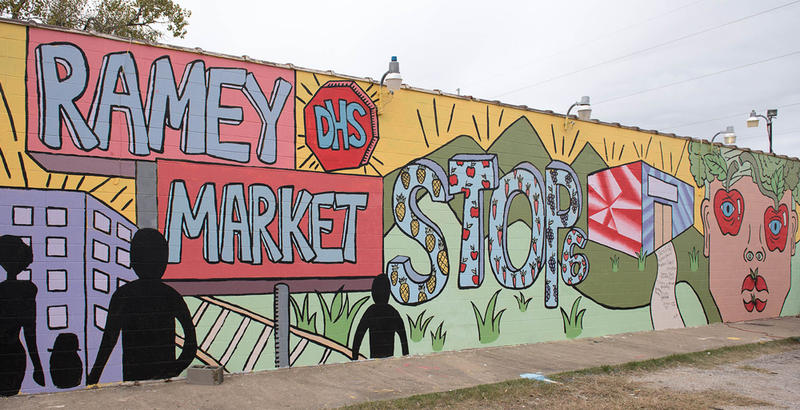 The students developed four designs which were blended to create a mural celebrating their school, their neighborhood, and their corner store. Ramey Market's completed mural. Photo by Carol Murray, marketing communications manager for the Blue Zones Project – Fort Worth. To read more about the December 10, 2016, unveiling of the mural, check out this blog post on www.plan4health.us. Success story developed with Linda Fulmer, executive director, Healthy Tarrant County Collaboration. Top image: Group at the Ramey Market unveiling in December 2016. Photo by Carol Murray, marketing communications manager for the Blue Zones Project – Fort Worth.